Another gourmet dish emerges from my almost-no-grocery shopping vow. We have a lemon tree, which last year produced perhaps 200 lb of Meyer lemons. Needless to say, we were very popular with colleagues and neighbors. I FINALLY made preserved lemons, which I've been meaning to do for years. Nabbed this Claudia Roden (LOVE HER BOOKS) recipe from the NPR website. No lemons next year. Our poor tree almost died in the terrible freeze. The little bit that is left (it looks like one of those hairy dogs after a major haircut, only the "hair" in this case was living matter) got some buds, but they did not set. We're going to have this on couscous. Have you ever had preserved lemons? Claudia Roden's recipe from Arabesque (Knopf, 2005) is my choice for its sheer clarity and sure-footedness. In a wide casserole or heavy-bottomed pan that can hold all the chicken pieces in one layer, heat the oil and put in the onions. Saute, stirring over low heat, until they soften, then stir in the garlic, saffron and ginger. Put in the chicken pieces, season with salt and pepper, and pour in about 1 cup water. Simmer, covered, turning the pieces over a few times and adding a little more water if it becomes too dry. Lift out the breasts after about 15 minutes and put them to one side. Continue to cook the remaining pieces for another 25 minutes or so, after which time return the breasts to the pan. 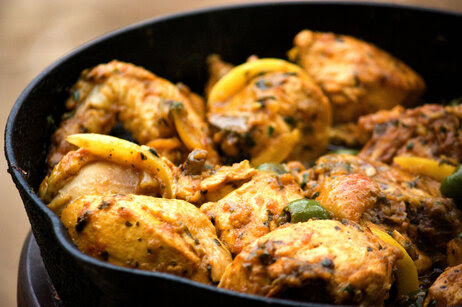 Present the chicken on a serving dish with the olives andlemon peel on top of the meat. I am making this tomorrow! I have four large jars of preserved lemons in the refrigerator (a friend had a bumper crop) and have been looking for ways to use them. Thanks for your marvelous blog. So sory abut your tree and hope it recovers! I 'cheat' (no yard) and buy a preserved lemon confit which is sublime spread on salmon filets or chicken, then baked in oven.